A month later, and back at my Grandparents’ house and back at that same candy store that only stocked Marvel Comics, I had the opportunity to pick up the second half of the MARVEL TEAM-UP story that I’d begun previously. This would be my final such chance, though, as the store shortly thereafter stopped carrying comic books, an occupational hazard to be dealt with in the 1970s. This issue has the look of something that was jammed out pretty rapidly. 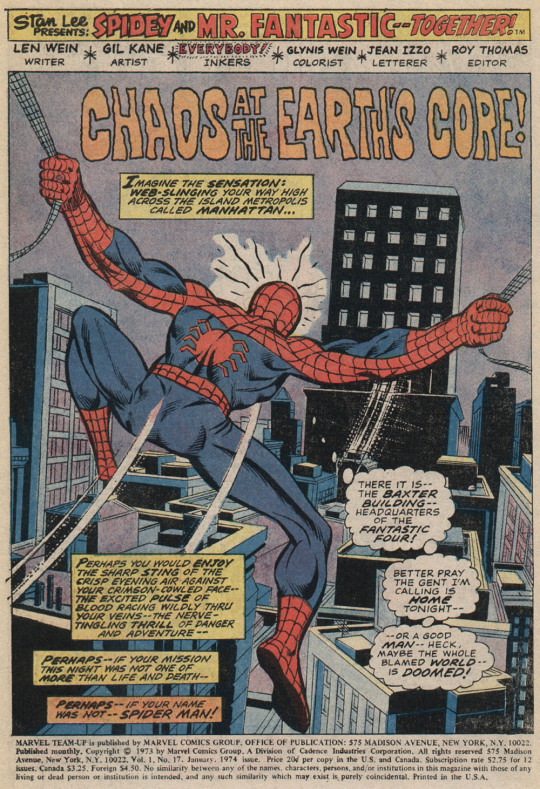 For one thing, the inking is credited to Everybody, and you can find some telltale signs of a few of the key Marvel inkers of the period in it. There’s also some odd lettering here and there–the credits and the title, for example, both look crude to me, especially in contrast to much of the rest of the lettering. Also, much like the previous issue, I found the panel compositions claustrophobic and chaotic. 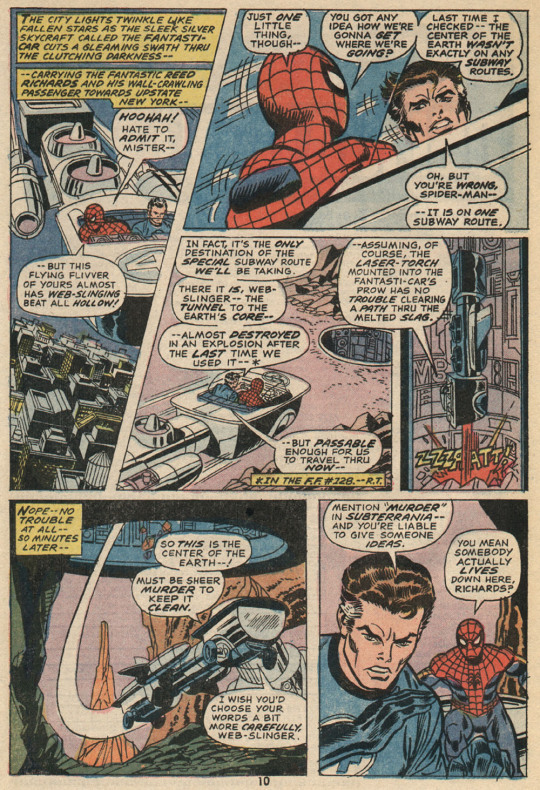 The story opens with Spider-Man making a beeline to the Baxter Building, headquarters of the Fantastic Four, where he fights his way through the building’s sophisticated security systems before being confronted by Reed Richards. Spidey tells Reed that he’s not here to see his friendly enemy the Human Torch, but is rather seeking out Reed himself, and downloads the stretchable scientist on the events of last issue and the fact that Captain Marvel is stuck in a gem sinking to the center of the Earth. 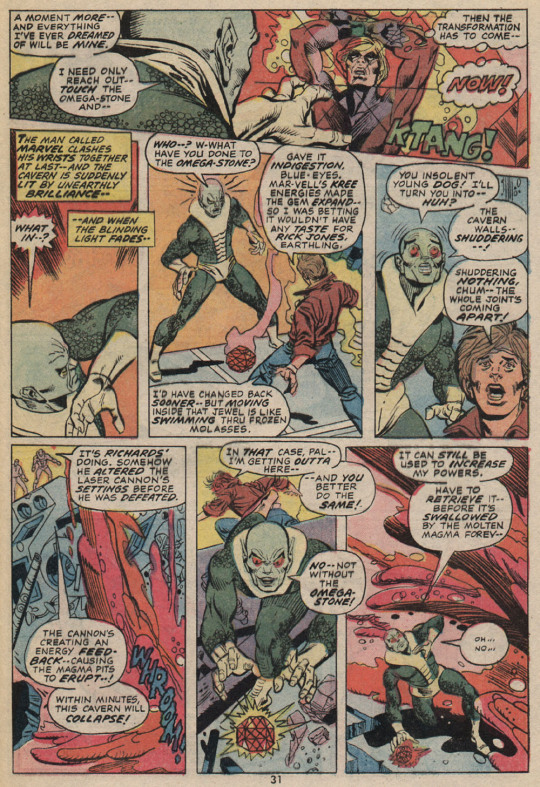 The story makes a few oblique references to what was going on then in FANTASTIC FOUR–specifically, that Reed had just gotten done turning his son Franklin into a vegetable in order to prevent his mutant powers from running amok, and that the FF were more broken up than ever as a result–but I was probably better off unaware of the specifics. 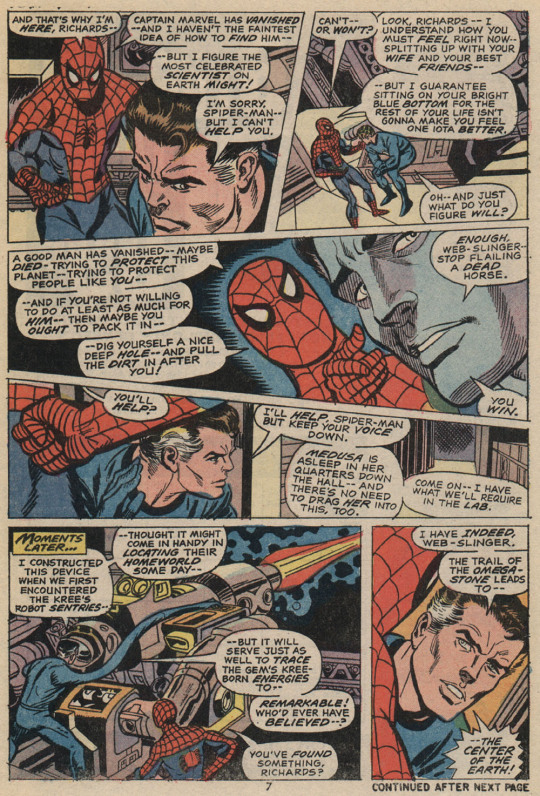 Either way, in a sequence that stayed with me, Reed and Spidey head out to the tunnel to the Mole Man’s kingdom that had been set up in previous stories. Spidey and Miser Fantastic put up a good fight against the Mole Man’s subterraneans, but in the end they are gassed and captured. Dragged before him, the Mole Man takes advantage of the circumstances to lay out his latest scheme. He’s got the Omega Stone with Captain Marvel trapped inside of it, and he’s made it the central component of a mighty laser with which he intends to attack the surface world. 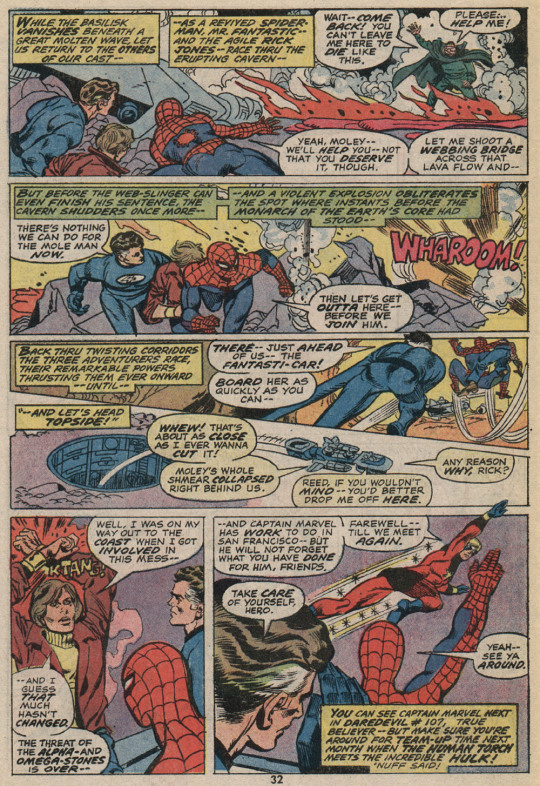 Spidey and Reed are able to break free, but they’re wildly outnumbered. 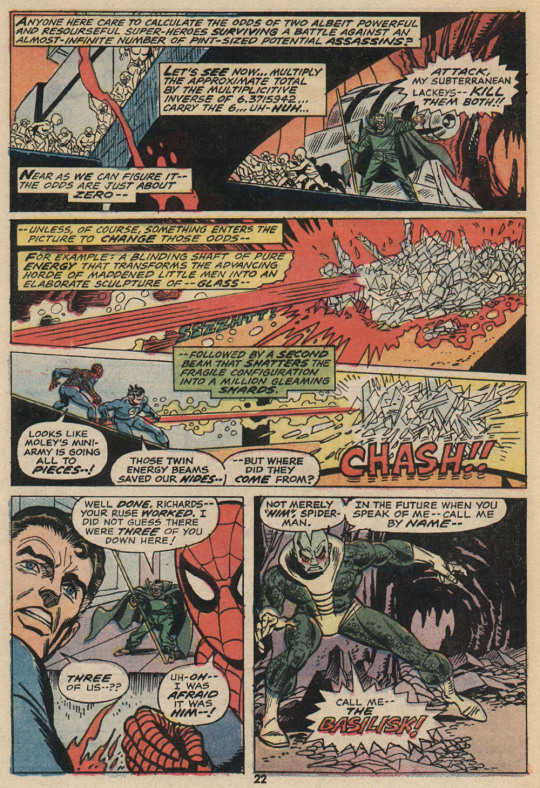 Salvation, however, comes in the form of a loose end from last issue, as the Basilisk arrives, having followed the heroes into Moley’s domain The two villains spend most of their time fighting one another, but even so, Spidey and Reed can’t seem to get poor Mar-Vell out of that ovesized jewel. Until KTANG! Mar-Vell, who had been slowly bringing his wrists together despite the jewel’s resistance finally manages to strike the Nega-Bands together, and have his atoms exchanged for those of Rick Jones. (Since Mar-Vell’s time limit outside of the Negative Zone was three hours, these events must have happened pretty quickly, or else the gem somehow sustained him.) Either way, Rick is released, the jewel is returned to its normal size–and it and the Basilisk are swept up in a flow of lava. 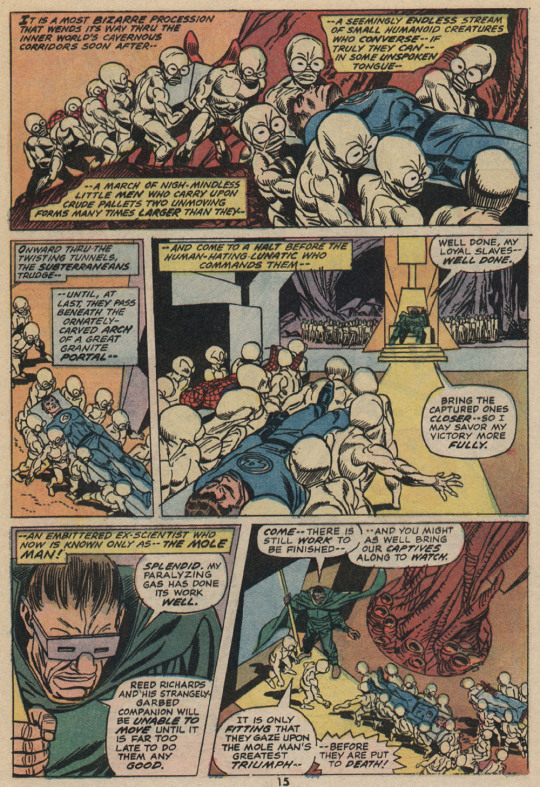 As the Mole Man’s subterranean lair is destroyed by the lava, the three heroes can’t be bothered to provide him with any aid or assistance, despite his pleas for help. Instead, they head back to the surface, and ten quickly wrap things up in the few remaining panels, with Mar-Vell soaring off into an issue of DAREDEVIL and Spidey and Reed feeling pretty good about themselves. Me, I didn’t hate it, but neither did I really love it. It wasn’t what I wanted out of my super hero comics at that point. So when a choice was presented to me on a spinner rack, I inevitably went with a DC book.